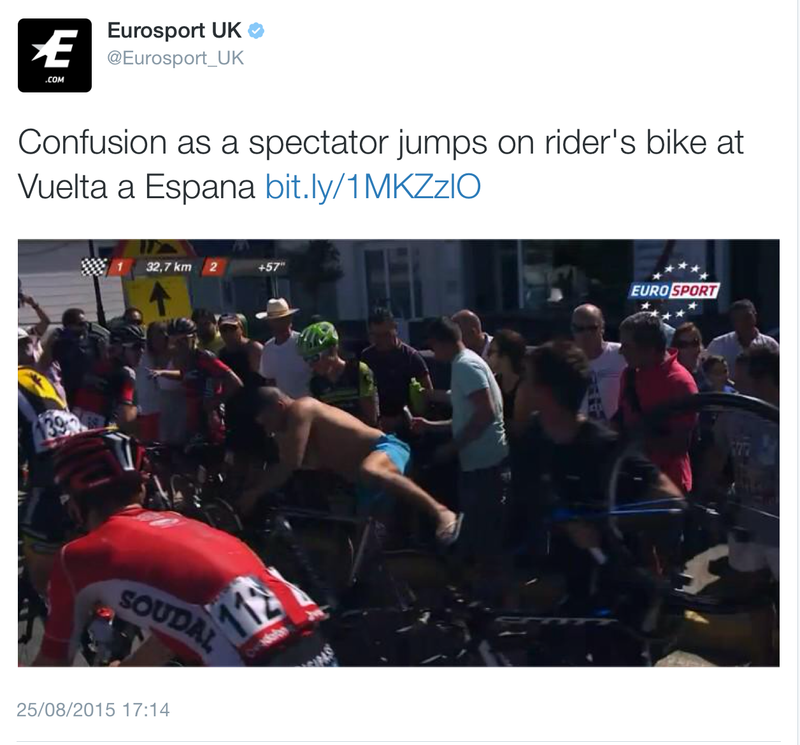 This Vuelta just gets spicier and spicier – but sometimes for all the wrong reasons. 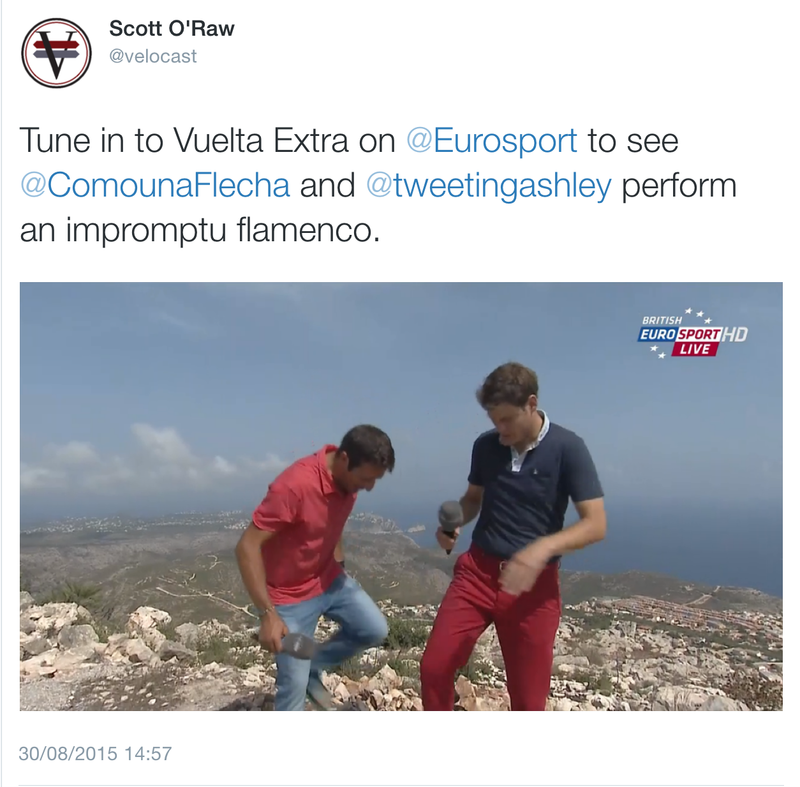 However, we’ve had a great push-me-pull-you competition for the red jersey with The Chaves-Dumoulin Show – and I’ve got the tweets to prove it. 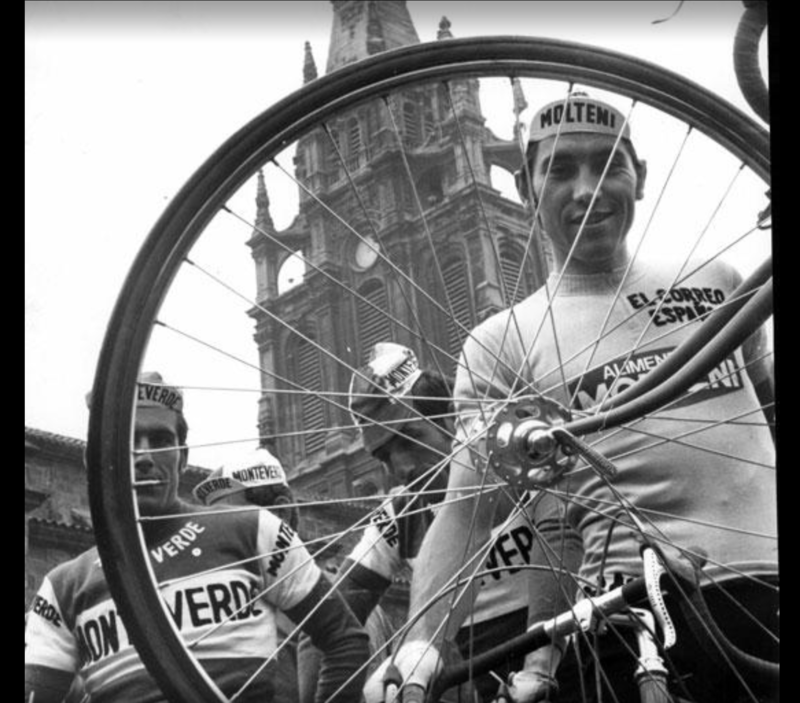 We also talk about all those crashes, and we have a fairly sizeable gruppetto, which includes Tigger (aka Juan Antonio Flecha). 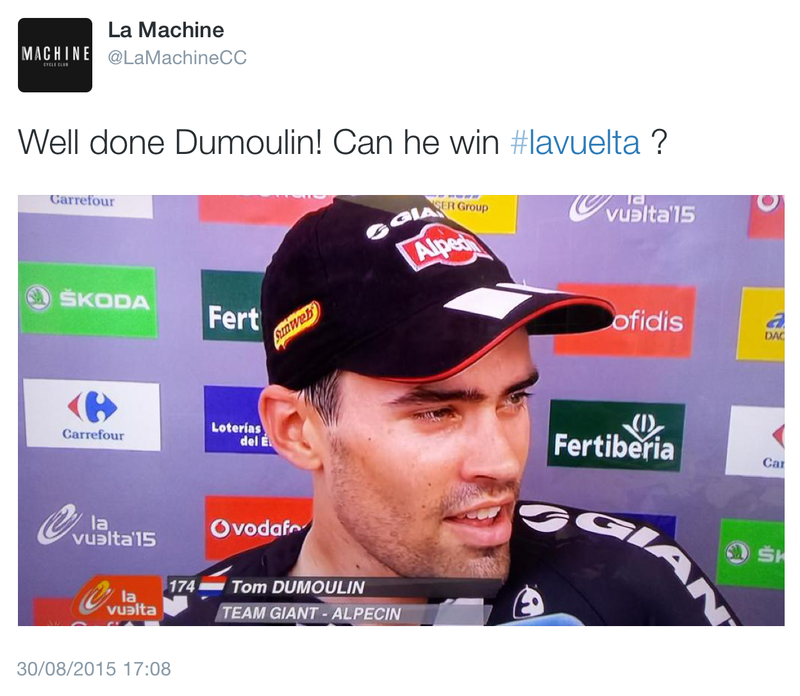 He held the red jersey for most of the week – he lost it on stage 5 to Tom Dumoulin but then got it back the next day. 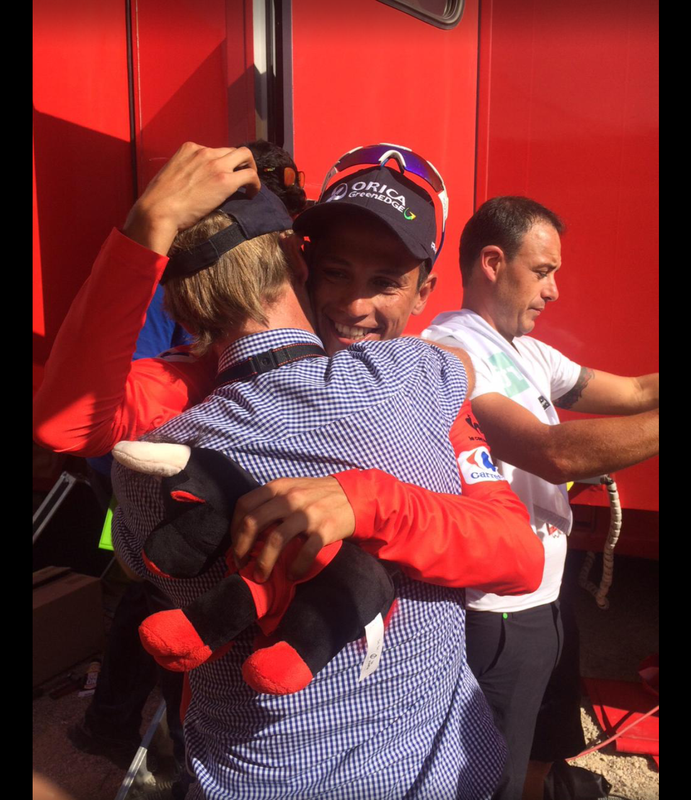 Then he kept it until Sunday’s stage but throughout the whole week, he rode with a lot of heart. 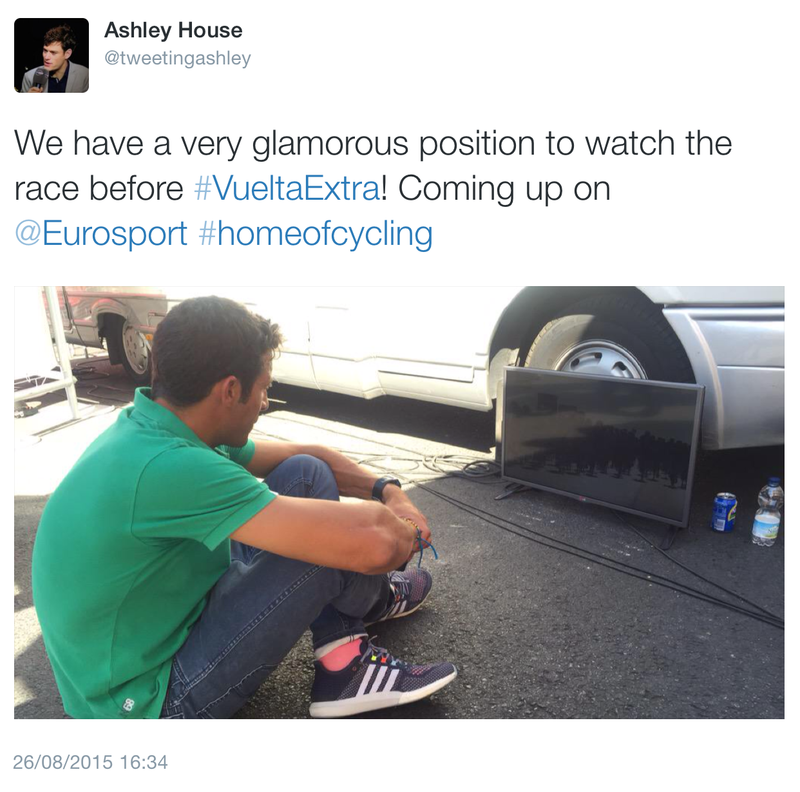 And he became a regular fixture with Ashley and Juan Antonio. 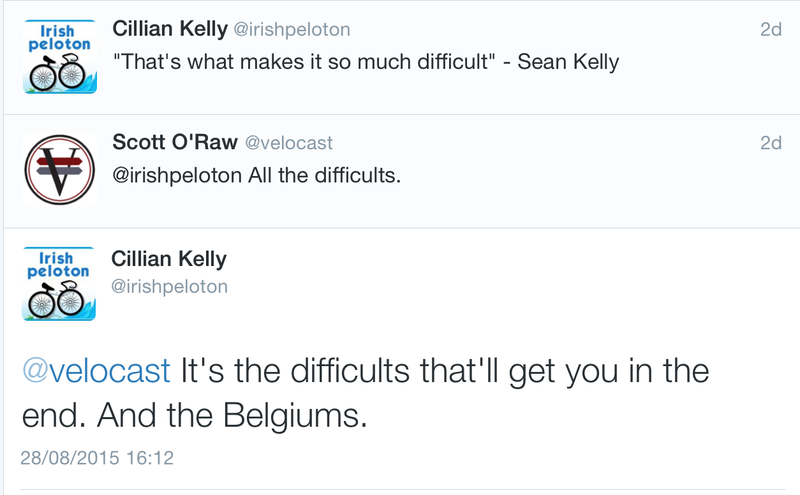 The red jersey took a tumble on stage 8 and held nothing back when he talked about where it hurt. 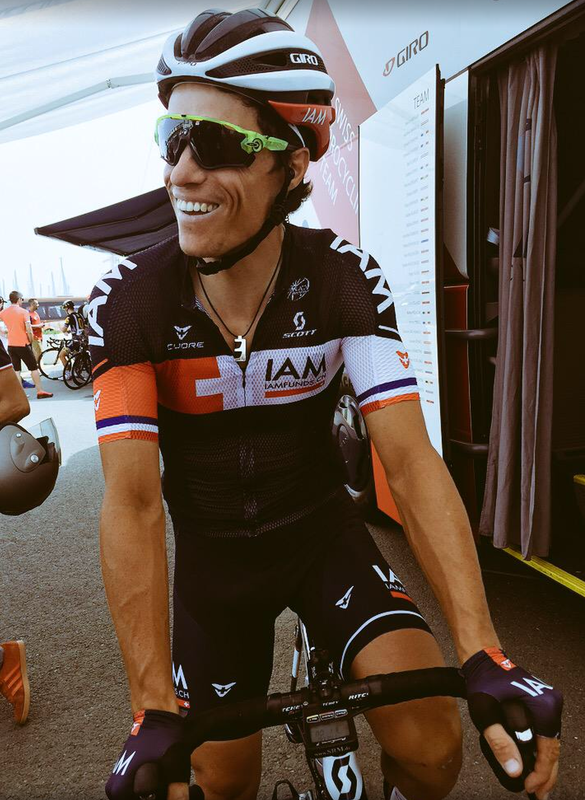 A huge for his DS on stage 6 when he attacked and took back the red jersey. 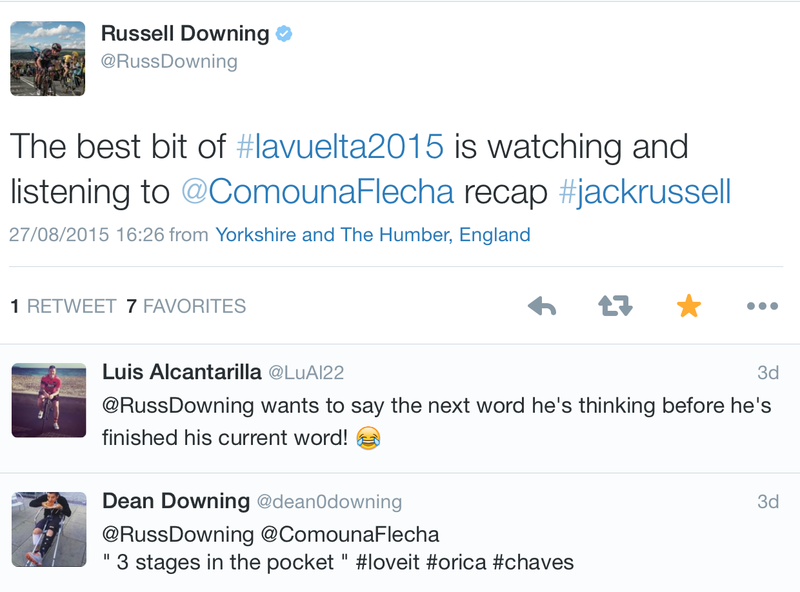 The balancing factor for the Chaves show was Tom Dumoulin – or Dumoulin Rouge. 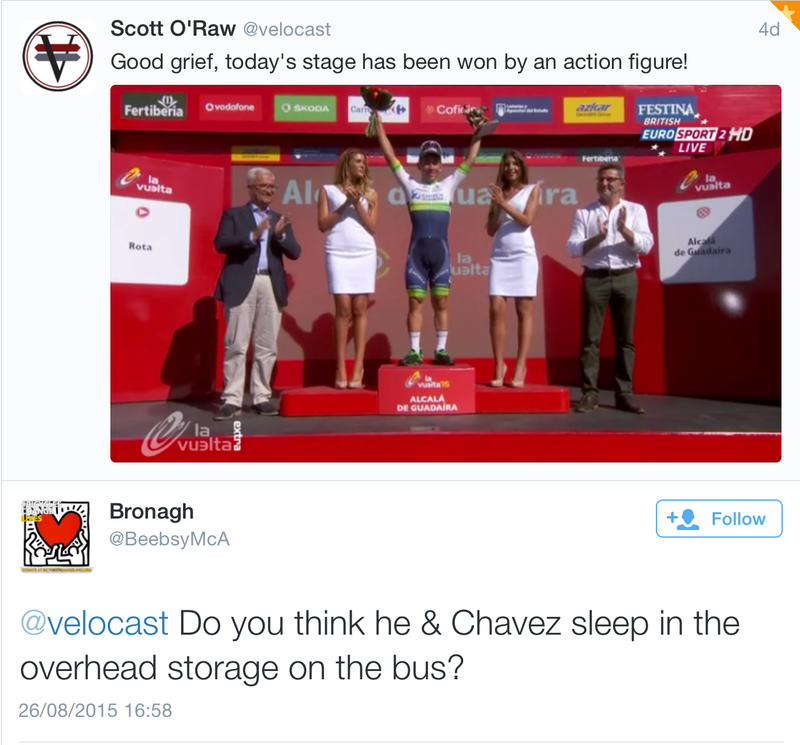 He wore the red jersey on stage 6 but only for that stage. 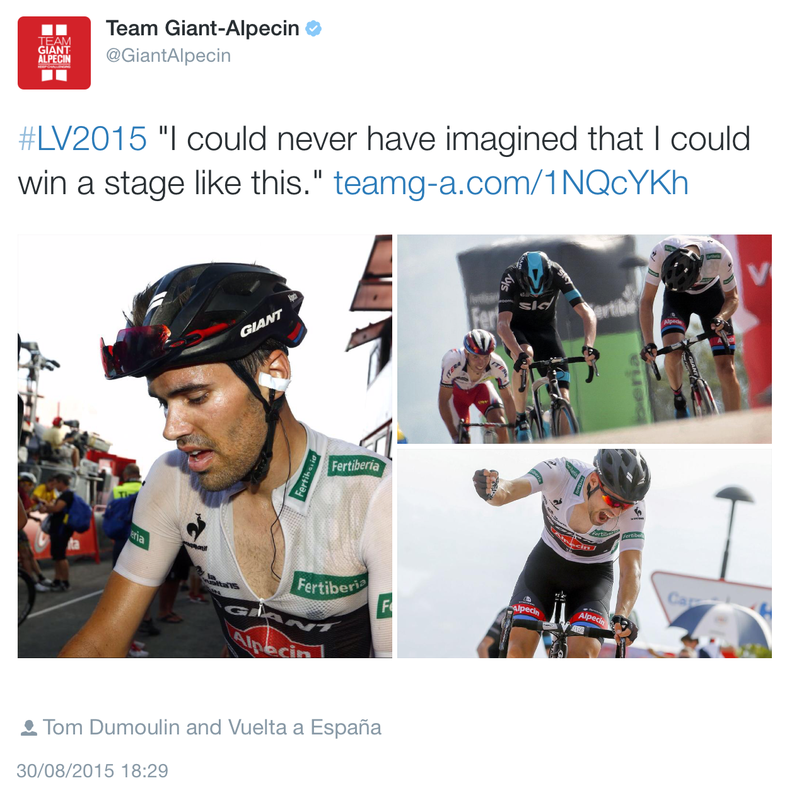 That is until Sunday when he powered up the climb with everything he had to take the stage and the red. 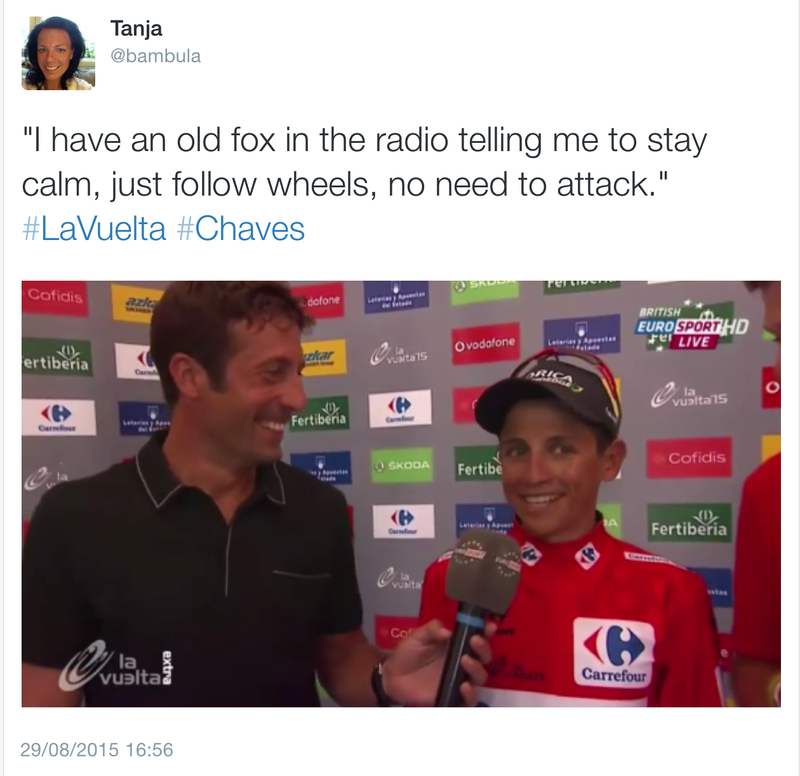 Not to put a dampener on everyone’s excitement but I think we’re jumping the gun with predictions about him winning this year’s Vuelta. 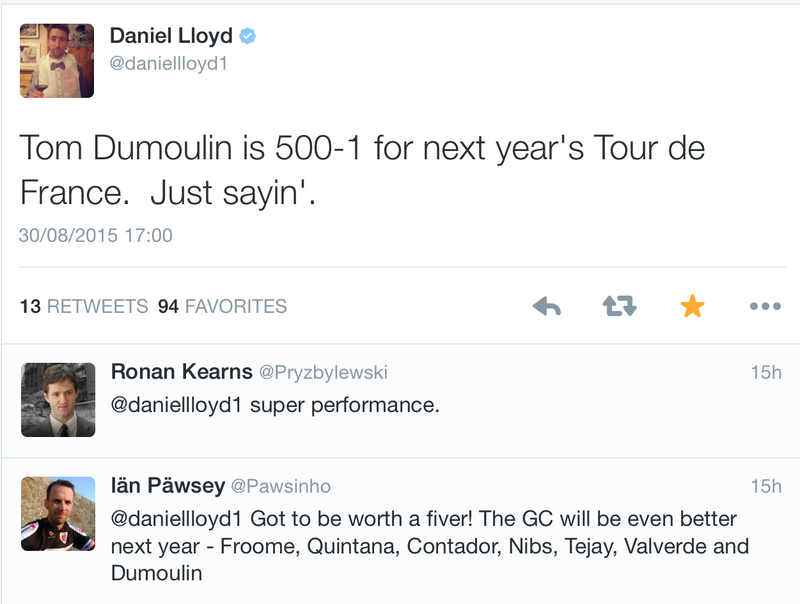 I might have to eat my words but I think the beast that is stage 11 will just be too much for him. So bet accordingly. 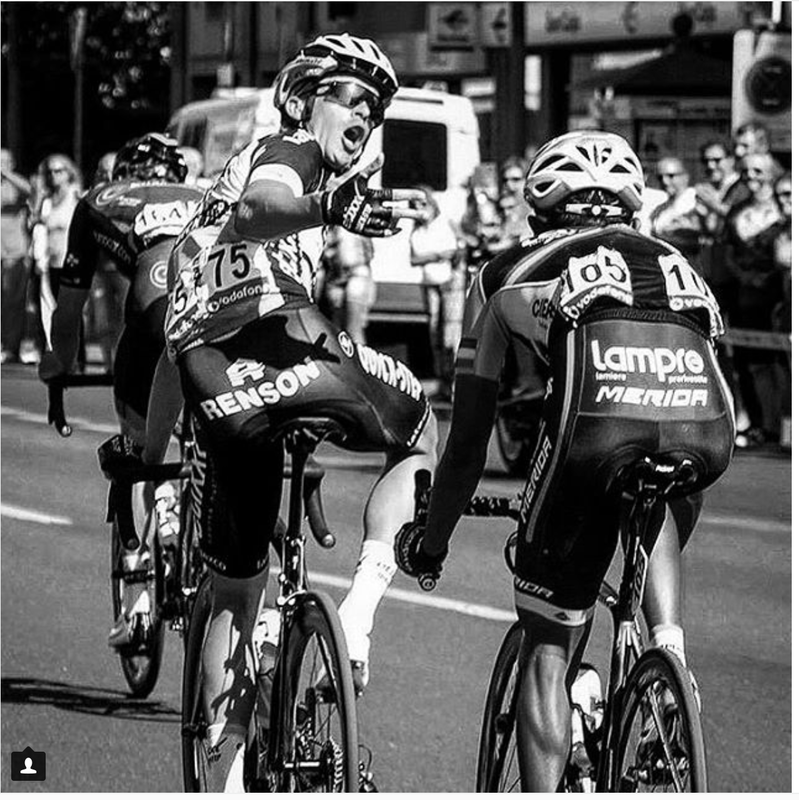 There was a huge crash on Saturday’s stage – one that took out Dan Martin, Tejay van Garderen, Nacer Bouhanni to name a few of the big names. 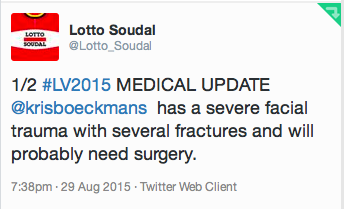 However, it was Kris Boeckmans who has the most severe injuries. 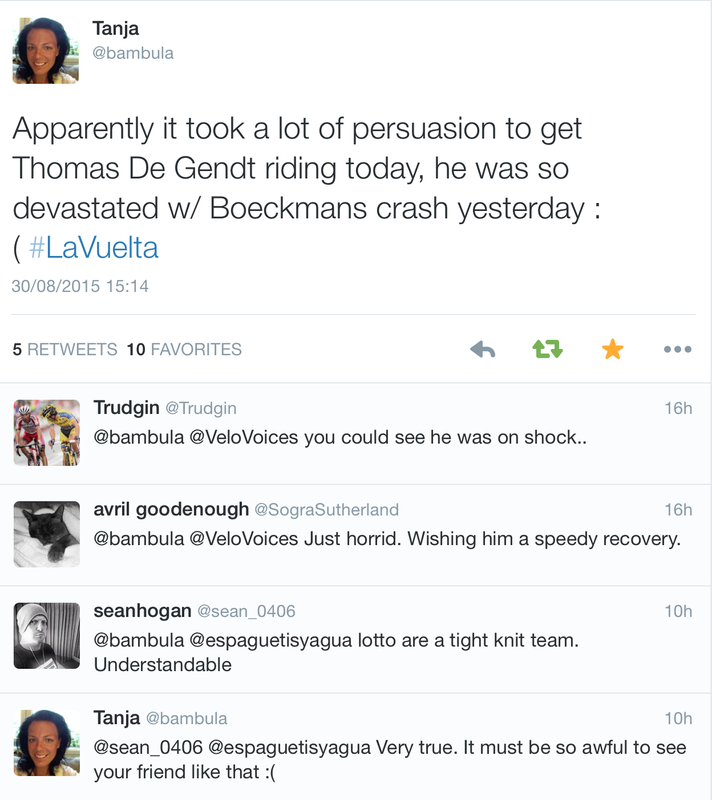 Teammate Thomas de Gendt tweeted his reaction to the crash – a heartfelt tweet that just reminds us that these guys are human and they have the same reactions that we would have if we saw a friend of ours unconscious on the ground. 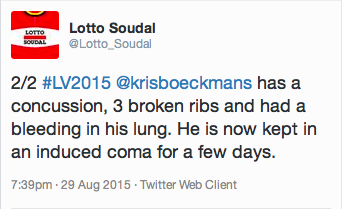 We also saw some great sportsmanship from Peter Velits, who stayed with Tejay van Garderen as they waited for an ambulance. 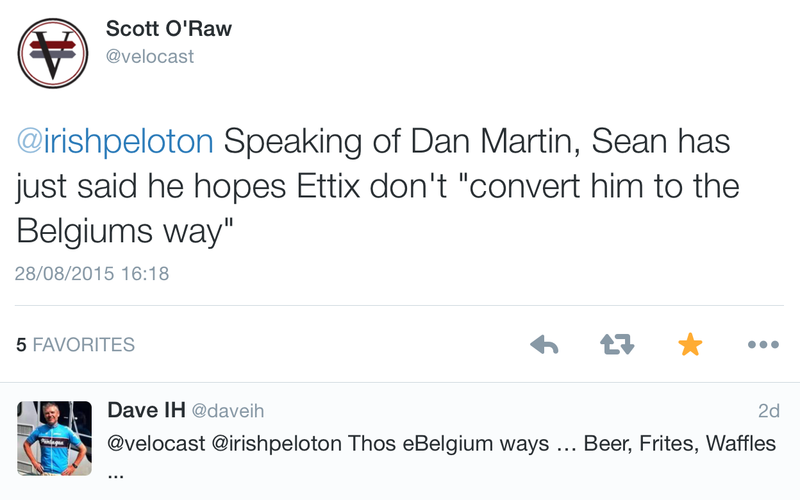 And then we had a moto knocking Peter Sagan hither and yon. This has been happening way too much in the last two seasons and it just seems to get worse. 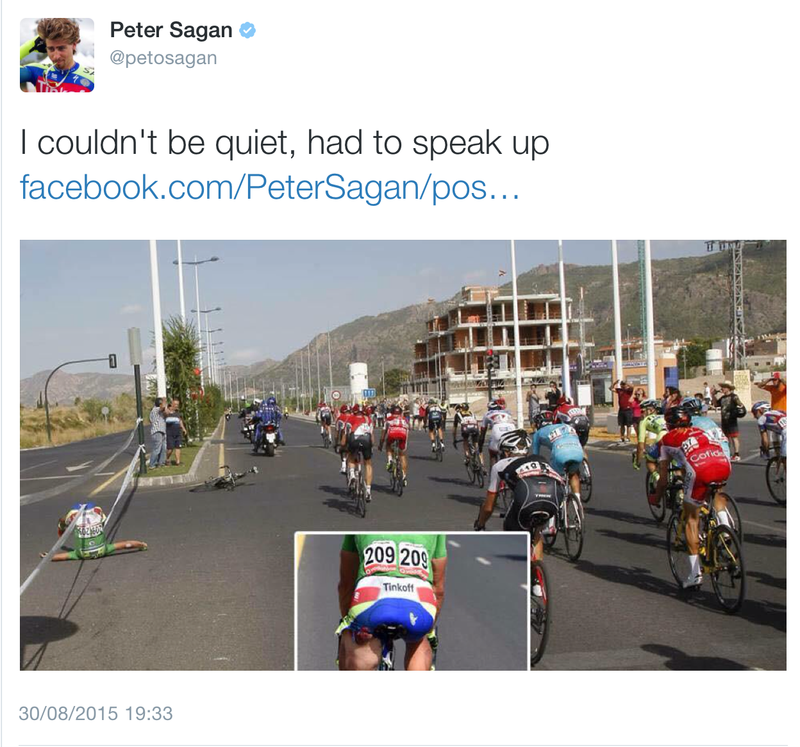 Sagan, who is usually quite even-tempered on the bike, quite understandably went nuts. 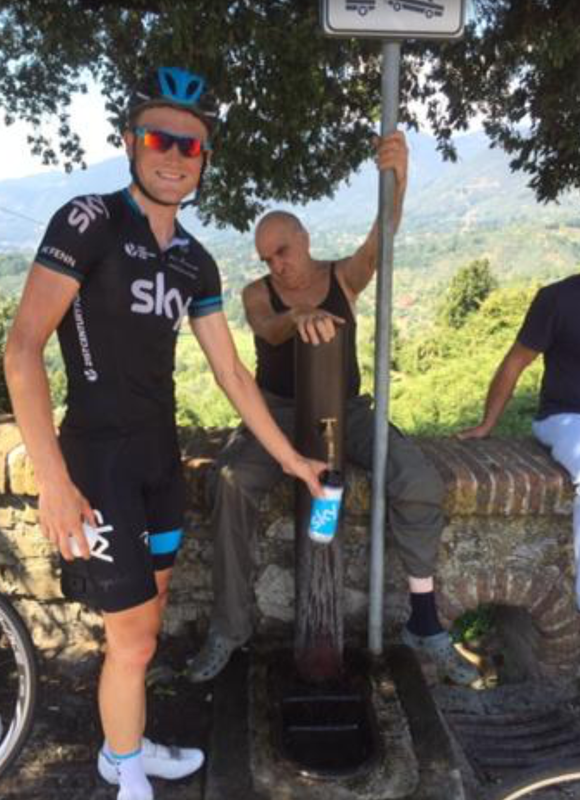 He was fined for bringing cycling into disrepute (or something to that effect). Here we have what it would look like if this happened in other sports. 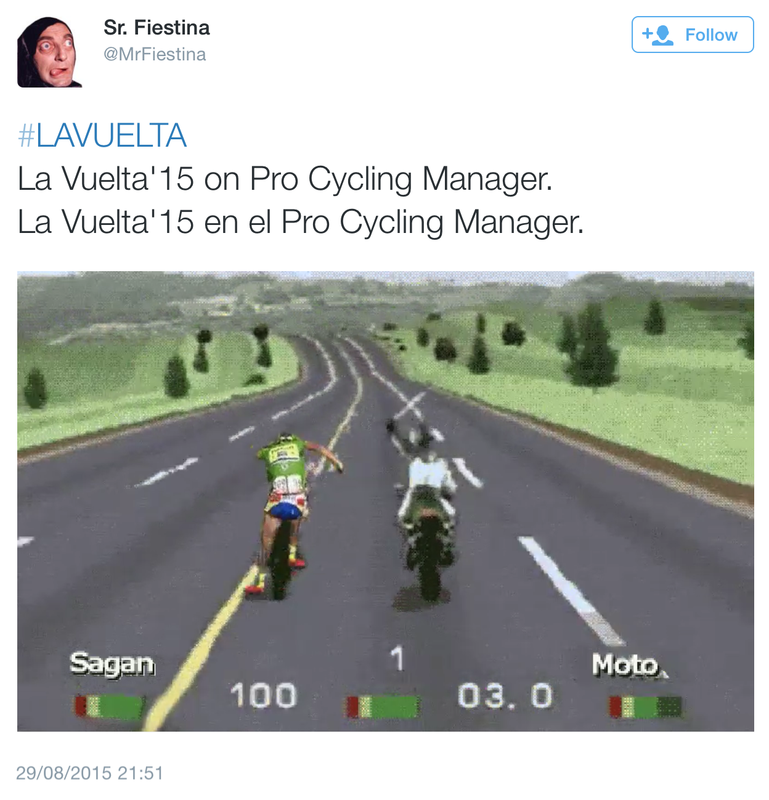 The moto driver got thrown off the Vuelta. There was some confusion as to who was responsible but Ashley had the answer. 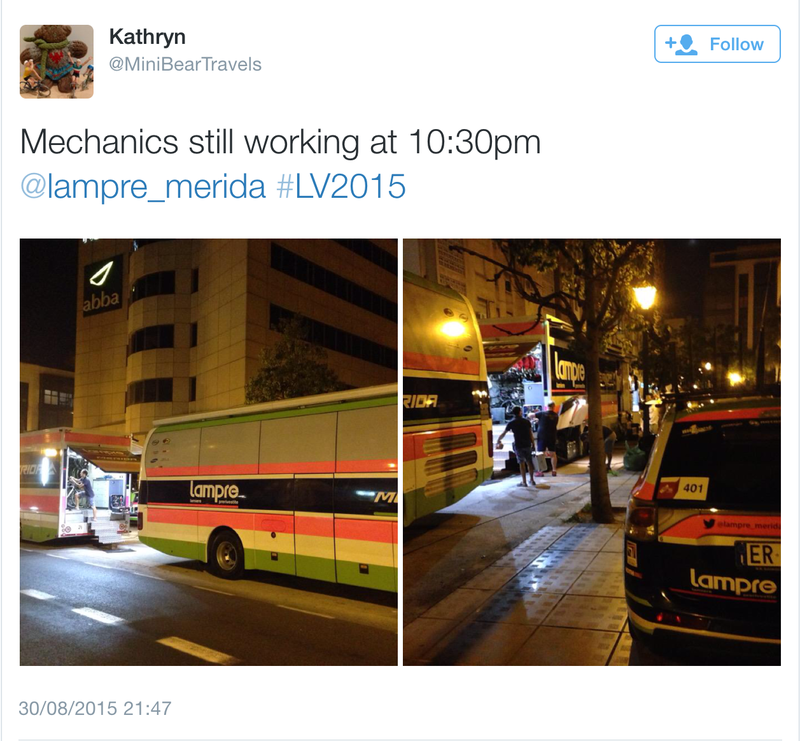 The Vuelta is a tough old race and there’s a lot of guys in the gruppetto. 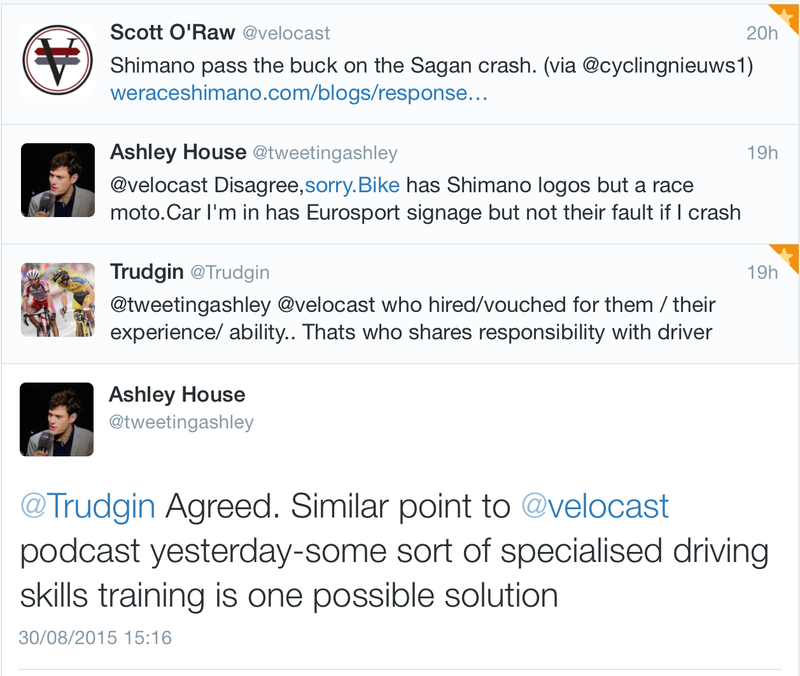 So it seems only right that there are a lot of tweets in *our* gruppetto. 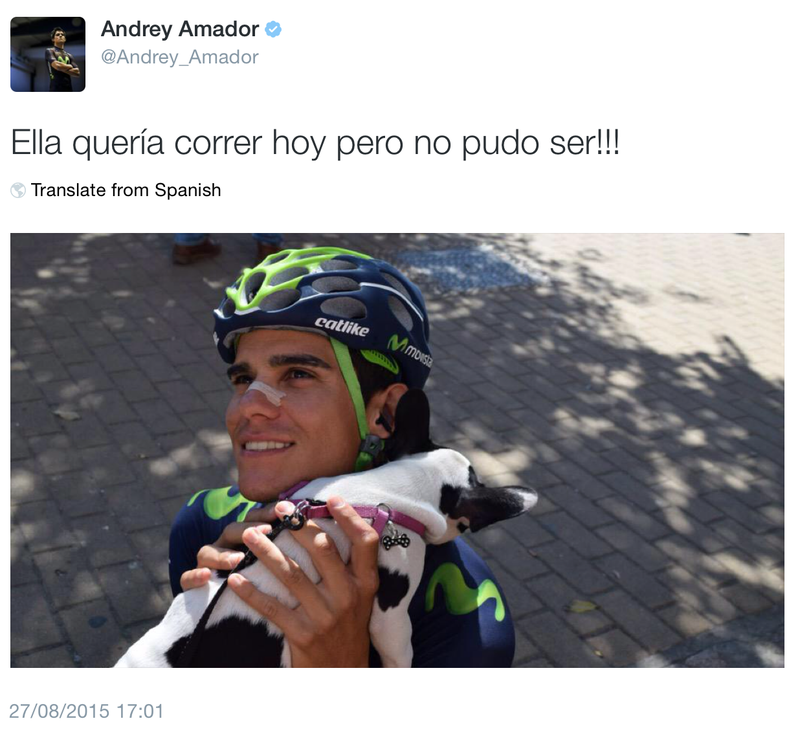 First up, my favourite Movistarlet, Andrey Amador … with a tiny dog. 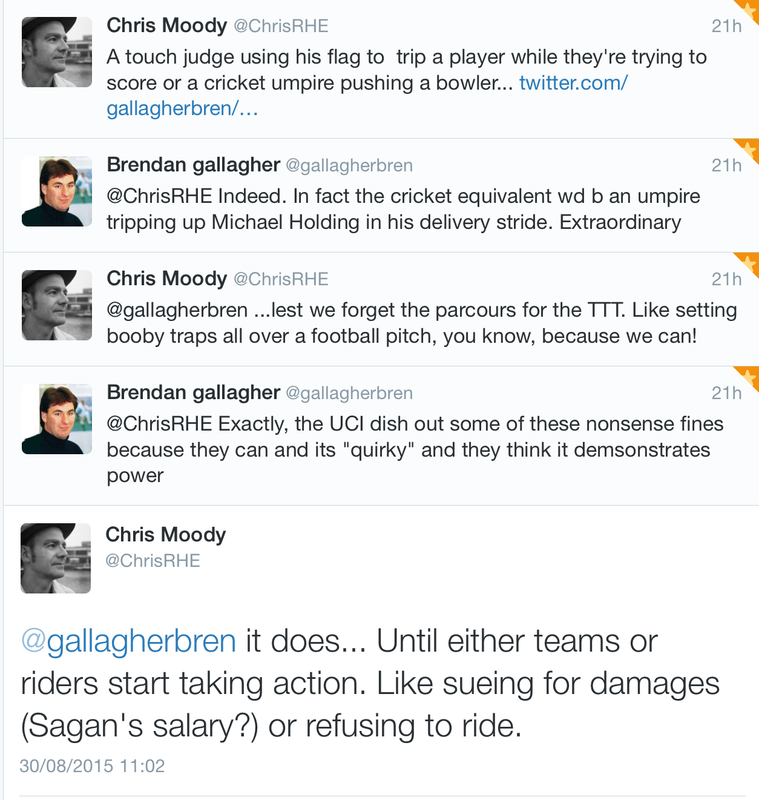 Who’s going to be invent the transfer jingle for cycling fans!? 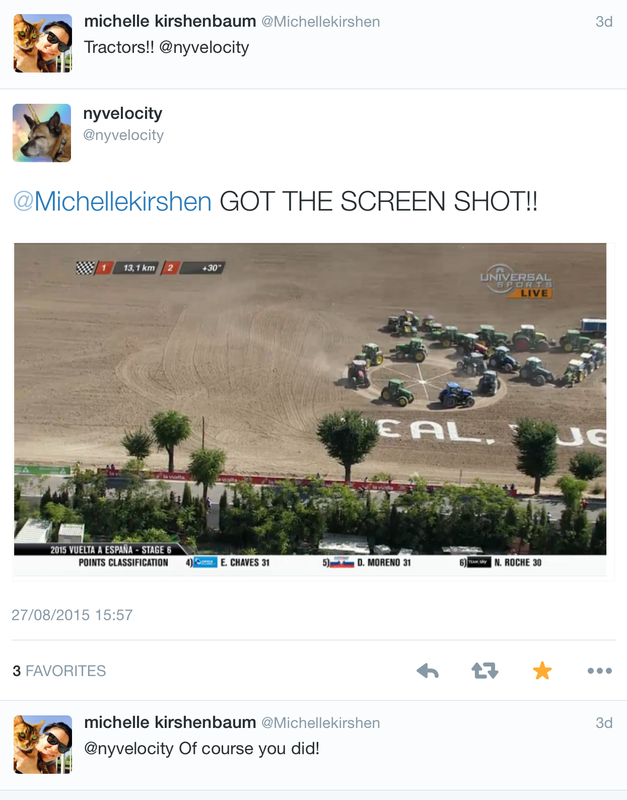 We were starting to think that the Vuelta had left tractors behind. But it didn’t. 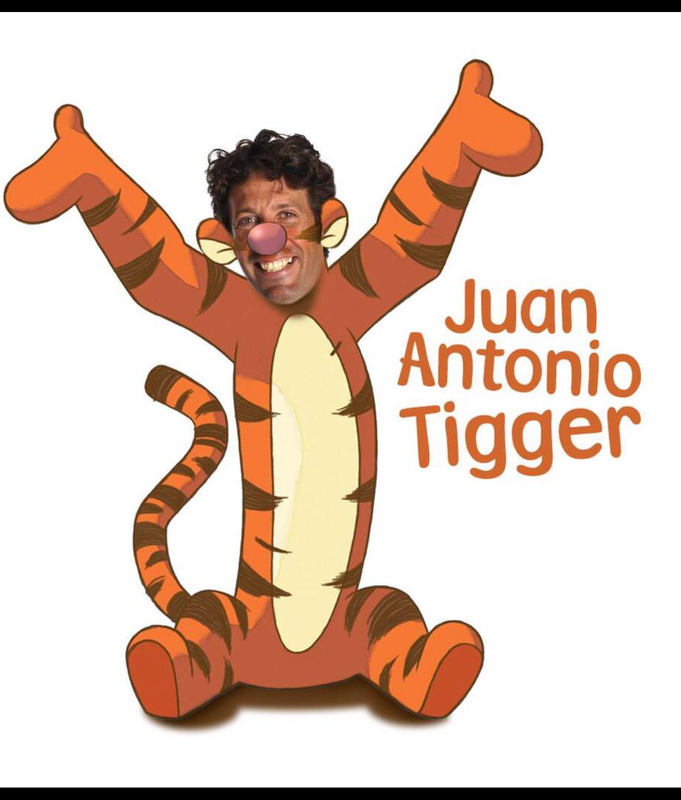 With artwork courtesy of Velocast, we have rechristened Juan Antonio as Tigger. It’s not a flamenco – it’s the Tigger dance. Ah, the secrets of television. Tigger has a lot of fans. And it’s not just us! I wonder how far the half-naked pudgy man would have gotten? 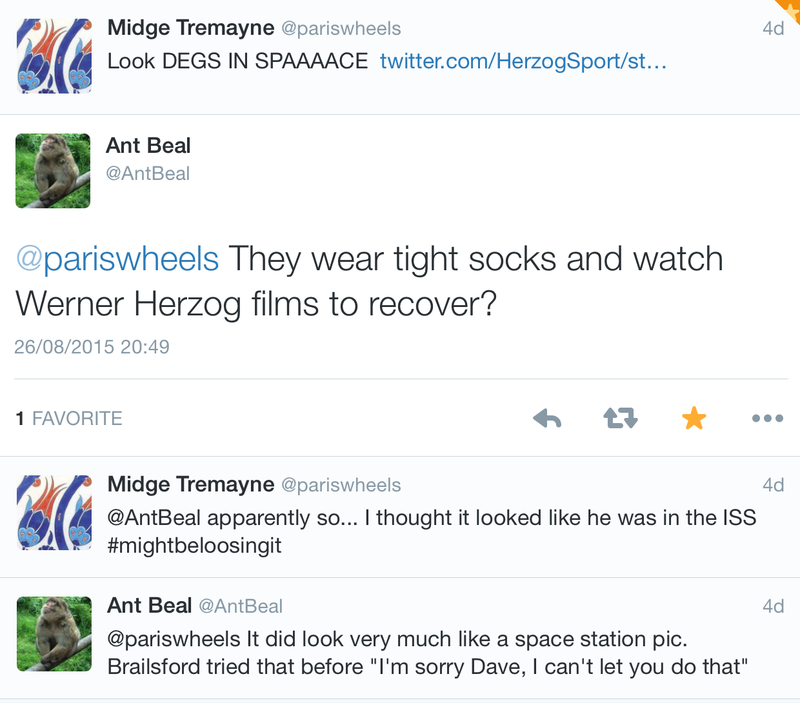 The magic of Twitter – it doesn’t just start rumours, it can put paid to them asap. 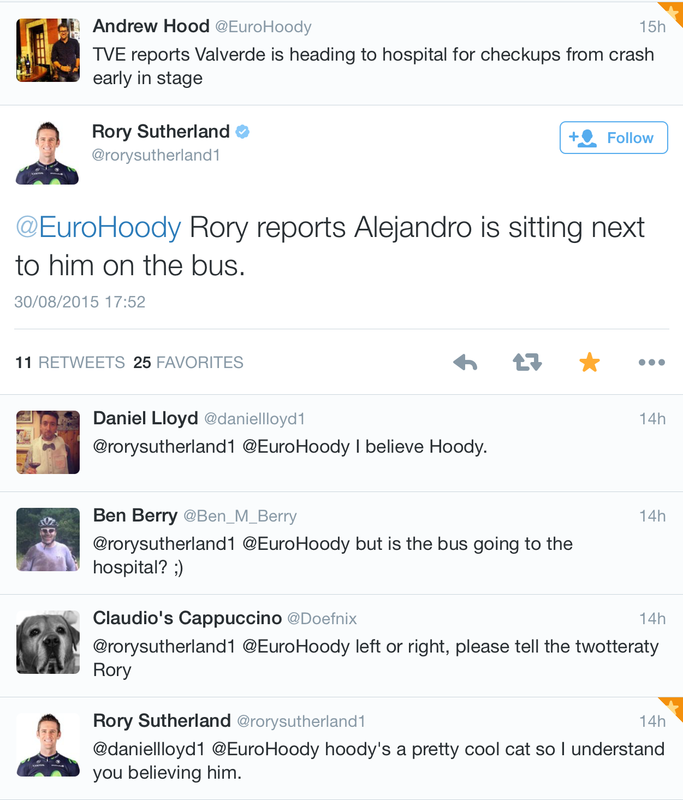 I love the quick and funny response from Rory Sutherland. When brands jump the shark. Vulpine, don’t fall into this trap! Please. Mechanics have a thankless (and long) task every day. 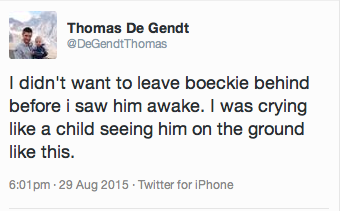 Therapy might be the only way forward after this. Nothing’s better than King Kelly and his difficults. 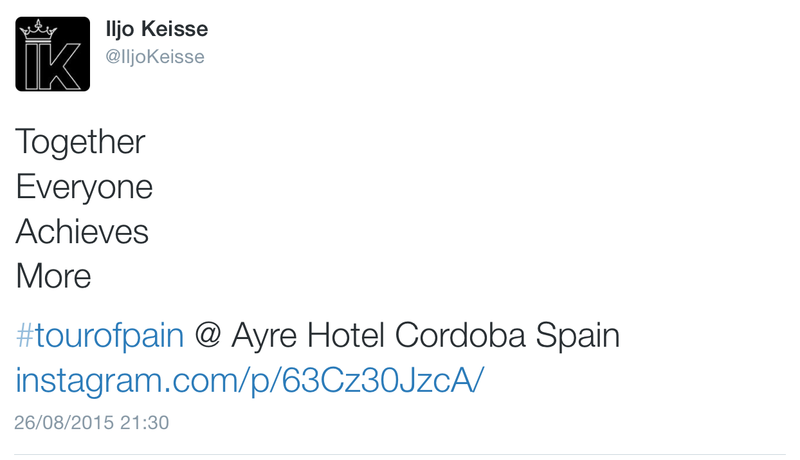 Iljo Keisse is not amused. It’s all in the positioning. 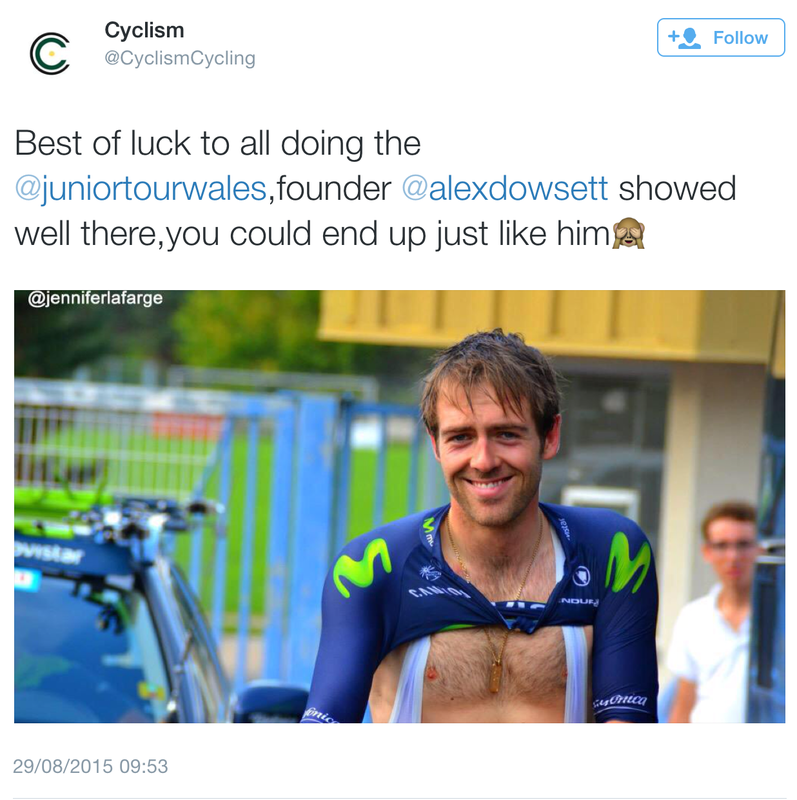 Alex Dowsett ‘showing well’. Well, indeed. 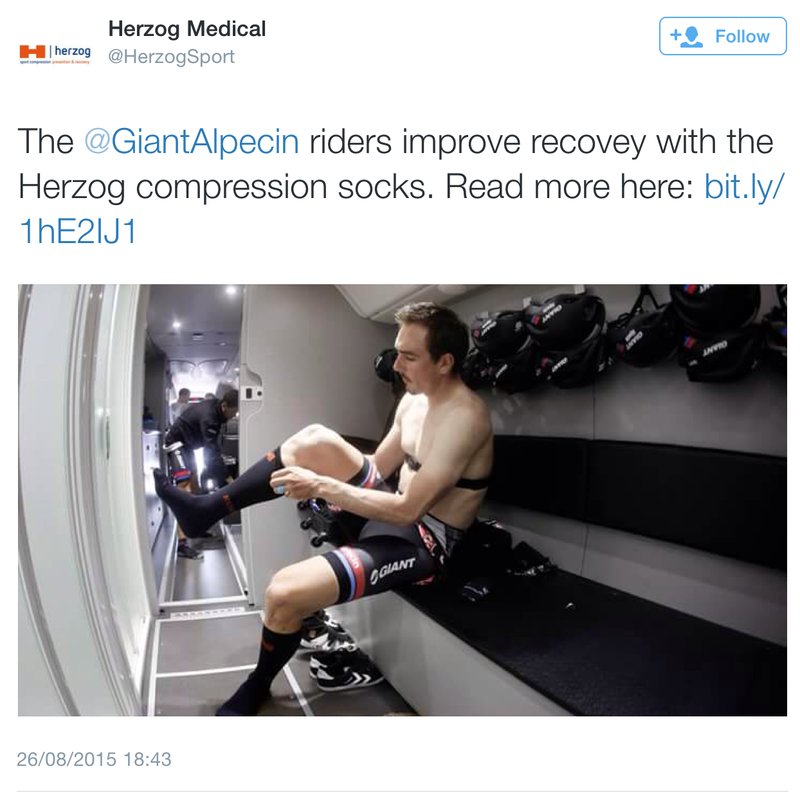 You have to admit, the Mighty Degs has no vanity – being photographed in compression socks and a heart monitor strap. I had to put this in because it is just downright beautiful. 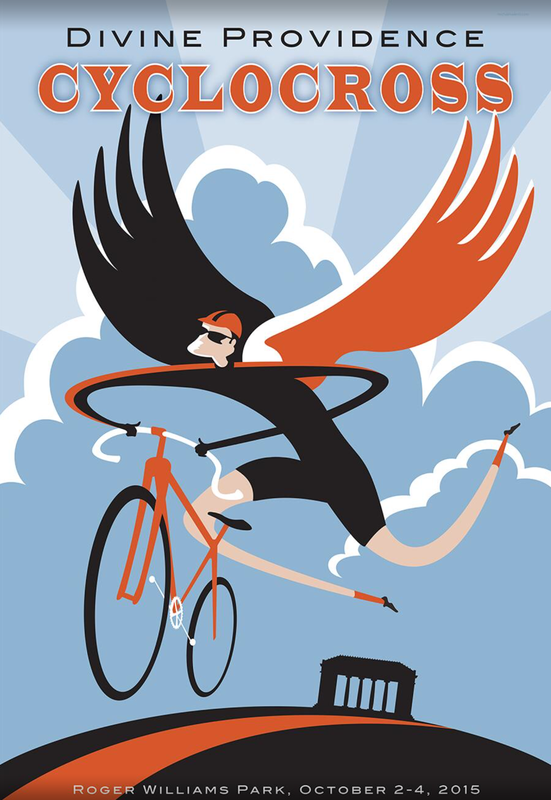 You can order one of Michael’s posters here (and I bet I’ll do a little post on them after the Vuelta). 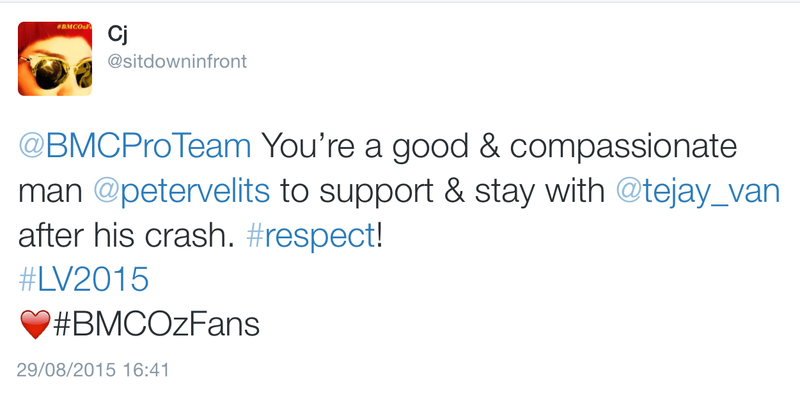 Seriously, has this guy got a contract for next season yet? 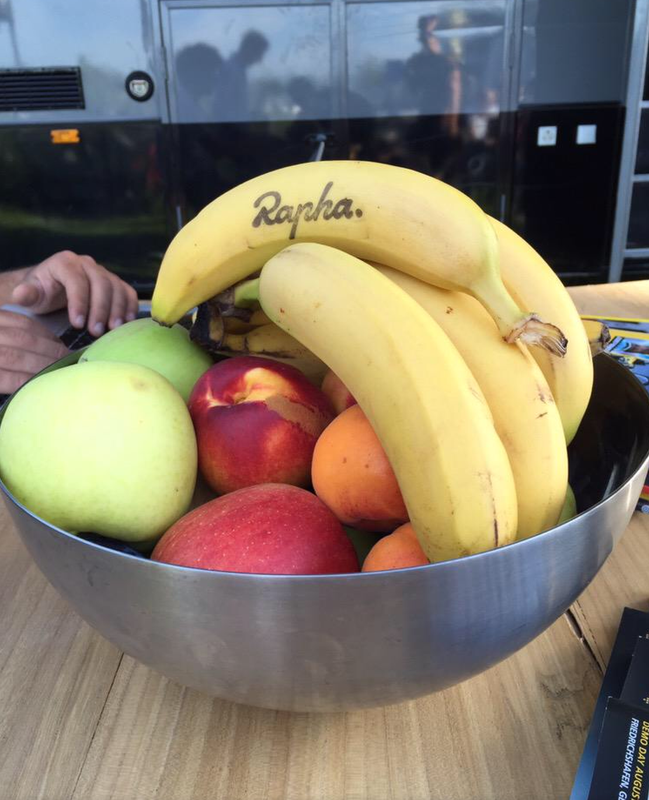 Saving space on the Orica team bus.